This book covers the key terms, concepts, thinkers and texts in semantics that students in linguistics and language studies will encounter. 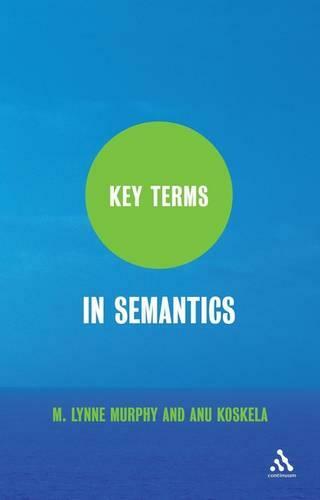 "Key Terms in Semantics" explains the all the terms and concepts in semantics which students on linguistics and language studies course are likely to encounter during their undergraduate study. The book is organized alphabetically, and fully cross-referenced. The book includes a section on key thinkers in semantics, from Aristotle to Noam Chomsky and will be a valuable desk reference for students throughout their undergraduate course. The final section presents a list of key readings in semantics, to signpost the reader towards classic articles, as well providing a springboard to further study. The book is accessibly written, with complex terms and concepts explained in an easy to understand and approachable manner. "The Key Terms" series offers undergraduate students clear, concise and accessible introductions to core topics. Each book includes a comprehensive overview of the key terms, concepts, thinkers and texts in the area covered and ends with a guide to further resources.